The VWR 2 Liter Digital Water Bath 89032-210 works great for a wide range of applications. This lab waterbath is constructed out of high quality materials to ensure product longevity in today’s vigorous laboratories. The VWR 2L water bath comes with built-in microprocessor controls which include an overtemp sensor to safeguard the bath against overheating. This water bath also features a LCD digital display, situated up-front with quick set controls that allow users to accurately set the temperature they want. This Unstirred Water bath from VWR comes with a gabled acrylic lid that channels condensation away from dripping back onto samples, while also providing support for a thermometer for external monitoring. 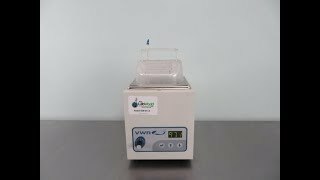 This VWR 2L Water Bath is in like new condition and comes backed with our standard warranty. Unit has been tested and is operating well at the listed specifications. Instrument ships within one business day. Please give us a call if you have any questions.